NASA – VV 340, also known as Arp 302, provides a textbook example of colliding galaxies seen in the early stages of their interaction. The edge-on galaxy near the top of the image is VV 340 North and the face-on galaxy at the bottom of the image is VV 340 South. Millions of years later these two spirals will merge — much like the Milky Way and Andromeda will likely do billions of years from now. Data from NASA’s Chandra X-ray Observatory (purple) are shown here along with optical data from the Hubble Space Telescope (red, green, blue). VV 340 is located about 450 million light years from Earth. 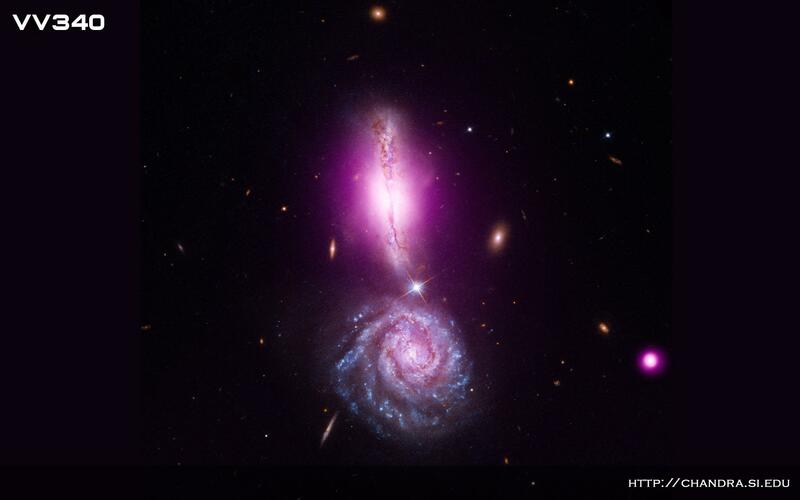 Tagged ARP 302, Chandra, Hubble, NASA, UGC 9618, VV 340.